Bambino is a cross of Sphynx and munchkin. The Bambino is one of the newest and rarest cat breeds. The look and personality of the Bambino was deliberately created by breeding select Sphynx and Munchkin cats. This crossing resulted in a short, hairless cat. The naming of the breed was chosen by Pat Osborne, who came from Italy, and felt the look and personality of the cat deserved the name “Bambino” meaning “baby”. Pat’s naming proved quite accurate, as this breed maintains its kitten-like appearance and behavior throughout life. Although fairly diminutive in size, the Bambino’s is a medium-boned cat with a strong, muscular body. 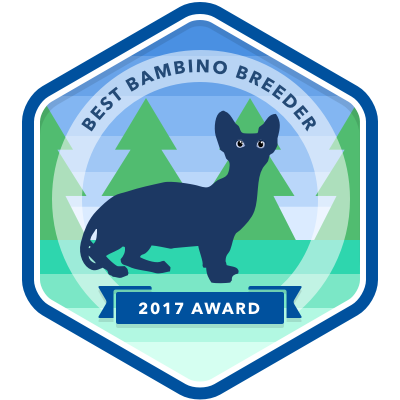 Bambinos typically weigh between 4-8 pounds, with males being slightly larger than females. They have a medium to long body, with a broad chest and round abdomen. The legs are strong and short, and the back legs tend to be slightly longer than the front legs. The Bambino has a strong, whip-like tail, and the length is well-proportioned to the body. Although normally devoid of hair, some Bambinos have what is referred to as a “lion tail,” which has a small tuft of hair on the tip. The Bambino has large eyes that are almond-shaped, widely set and slightly slanted. They have a short muzzle that gives the head a square appearance. Like the Sphynx cat, the Bambino has high cheekbones and prominent whisker pads, although whiskers tend to be short and sparse. They have very large ears that stand upright, giving this breed an inquisitive appearance. The ears of kittens appear huge, and these cats grow into them as they age. Bambino likes to engage in activities. Daily exercise will help maintain its body weight and keep its muscles toned and strong. Bambino is more active than Sphynx and very exotic in looks. This breed needs lots of attention. Owners who are home often or are able to participate in activities with this cat breed will be very happy with this breed. Please contact us to learn more about our bambino cats for sale.